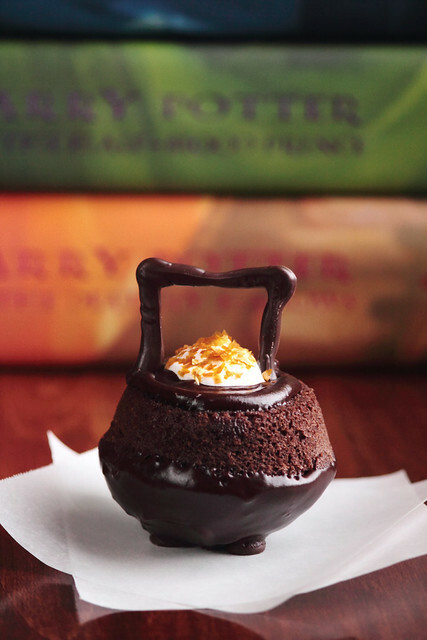 This is part II of my mini-series on Harry Potter snacks from the books brought to life (part I is on Honeydukes treats, part III features every wizard's favorite drink—butterbeer!— and part IV showcases decadent butterbeer cupcakes). When I was young, I wanted to grow up to be a writer. I also wanted to be a teacher, deep sea diver, and a cashier at McDonald's, but that's a different story. In early elementary school years, I would furiously write about anything and everything that came to mind. My stories expressed the affairs most important to a seven year old girl—monsters, dolls, and the first day of school. Though often incomprehensible, I was proud of my work. At the ripe age of eight, I took it upon myself to complete my first novel, Baby Gaga, which included 50 short chapters on the adventures of an articulate toddler learning to share, nap, and eat ice cream. It would seem I had a bright future in writing, but all of this was cut short as soon as I entered fourth grade. Somewhere along the way, I just lost interest. Perhaps writing wasn't "popular." Perhaps I was too critical of my own work—nothing I wrote was good enough to satisfy me. At home, I would devour novel after novel, but I was no longer tempted to write my own. For years, scarcely a sentence flowed from my pencil. Then Harry Potter entered my life. When I was fifteen years old, I became obsessed with the series. I would drink in as much of the magical world through the books and through the movies as I could. When that was no longer enough to satisfy my cravings, I began to seek out more. I discovered others who felt the same pull, the same desire to create more of this rich world. Together, we would write our own stories. I would borrow JK Rowling's characters and take them on my own adventures. I developed little known characters and gave them a story. A purpose. Writing became fun. And the words began to flow from my pencil once more. Harry Potter inspired me to continue writing again. Since then, I've worked to keep writing a part of my life. Over time, my chosen topics have changed as my style has evolved. Gone are the days of writing about Harry Potter. Instead, I find myself journaling or finding small ways to share bits and pieces of my life with you. While baking seems to come naturally for me, writing is still a challenge (and I imagine it will always be so). I often struggle with finding the right words to express the ideas swimming around my head. I am a slow writer, yes, but I have grown to love the art of the word. Sharing these words, thoughts, and ideas with you has become a natural part of my life. While writing can often feel like a chore, I find that the more I write, the more I am unable to imagine not writing. It has become a form of expression, a freedom, that is impossible to find anywhere else. 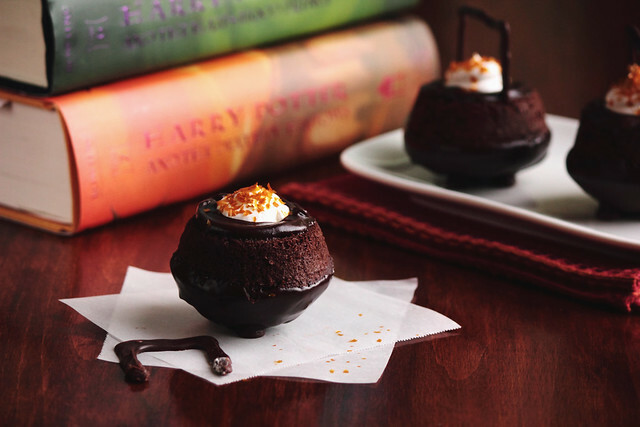 These Cauldron Cakes are the ultimate Harry Potter eye candy. They are easy to make, fun to eat, and, above all, delicious. Though the steps may appear long or complicated from a quick glance at the recipe below, I assure you they aren't. 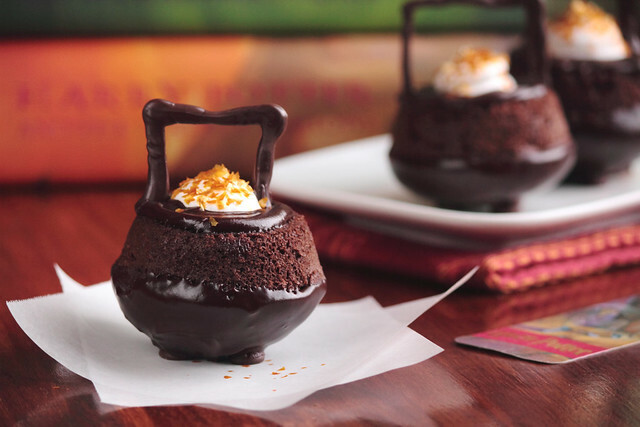 In less than an hour, you can have one of these cauldron cakes in your belly. By simply flipping a cupcake over, it opens a whole new world of possibilities. 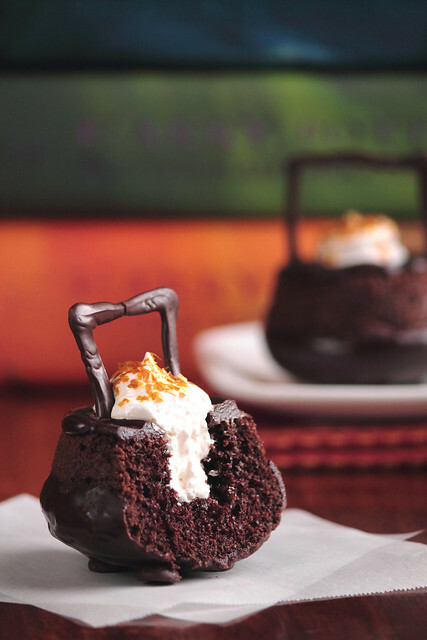 These cauldron cakes consist of devil's food cake cupcakes dipped into a rich chocolate glaze and filled to the brim with marshmallow filling. Chocolate chips form the cauldron feet, which not only keep these cauldrons looking more authentic, but stop the cauldrons from rolling around. I like to think the edible gold glitter means these cauldrons are filled with a little Felix Felicis (or "liquid luck"). These cupcakes would also make a perfect Halloween treat! 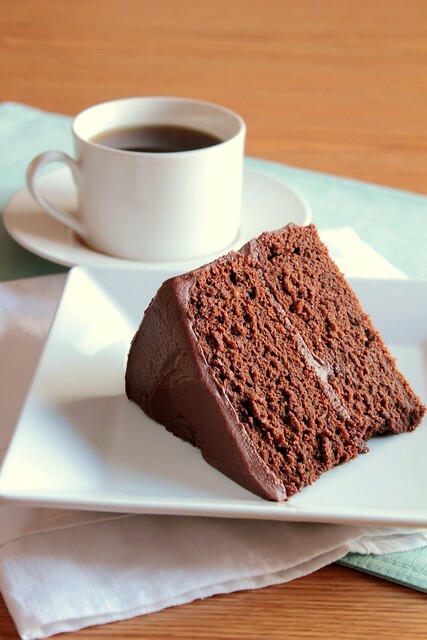 There is something to be said about a simple chocolate cake. No frills, no fuss, no mountains of too sweet buttercream to spoil the treat—just chocolate and cake. Growing up, I didn't like chocolate. I didn't like the way it looked, the way it smelled, or the way it tasted. I avoided brownies, chocolate ice cream, and chocolate cake like the plague. I'd snub my nose at candy bars. On my birthday, I would insist on eating strawberry shortcake—chocolate wasn't going to grace my special day. I was too cool for it and I wanted everyone to know it. Chocolate was the enemy. On occasion, I would gobble down as many chocolate chip cookies as possible. I loved chocolate chip cookies. I was probably too naive to understand the brown spots were chocolate. Or, better yet, I knew they were chocolate but I had a tough girl I-don't-eat-no-chocolate image to uphold. I don't remember much from this stage in my life (perhaps I am blocking it from memory because I cannot fathom a life without chocolate), but this is what my mother tells me. And we must believe our mothers. You can see my opinion on chocolate has certainly changed. Over 1/3 of the recipes on this website prominently feature chocolate as one of the main ingredients. I can't help myself. Chocolate is my vice; it corrupts me. I can't handle this level of decadence on my own, so I'm bringing you down with me. 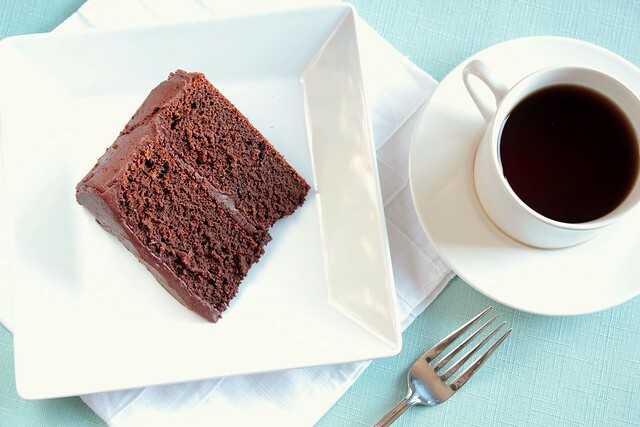 This devil's food cake is the quintessential chocolate cake. It is dense and rich with chocolate. It is thick and sticks to the roof of your mouth. It is satisfying in the only way chocolate cake knows how. The frosting is a dark chocolate frosting. 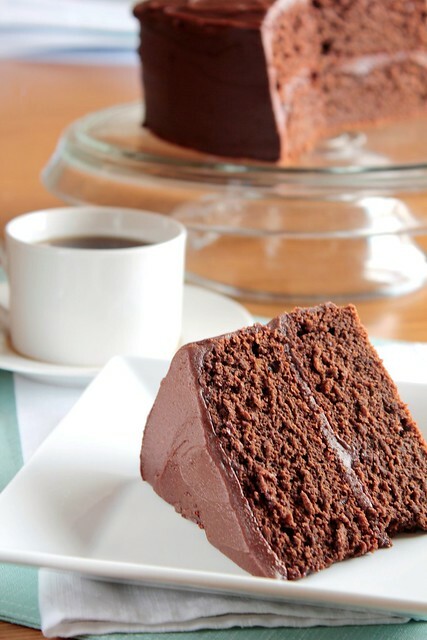 Made with brown sugar and unsweetened chocolate, it's dark, rich, and intense. This frosting isn't playing around. Combined with the devil's food cake, this is a lethal (and delicious) combination. 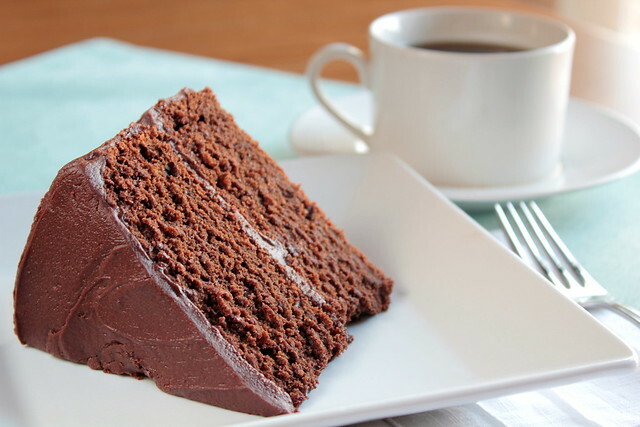 You need this chocolate cake.